The Bedini SG is a “right of passage” for anyone that wants to learn how to actually build real Tesla technology in miniaturized form. It is the best way to start for anyone that is new and even seasoned engineers have a thing or two to learn from it. It also reviews the Intermediate and Advanced books and discusses why knowledge of the Bedini SG is a * MUST HAVE * – especially if you’re interested in preparing for the future. 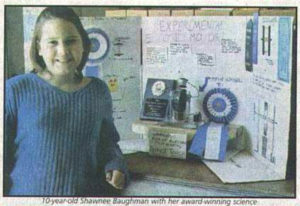 Fifteen years ago, Shawnee Baughman of Coeur d’Alene, Idaho was competing for an elementary school science project and an electronics wizard happened to work in the same building as her father. She was provided with a simple schematic and a bit of coaching. With that, she went off on her own to build a little motor that spun a wheel, lit an LED light, and ran from the same 9 volt battery for the entire five days of the science fair. Shawnee won a Blue Ribbon for the science, and a special award for Best of Show, and ever since that time, the machine has been called the “School Girl Motor” or the “Bedini SG” for short. John Bedini is an internationally acclaimed audio engineer who has many claims to fame, which include developing the first solid state audio amplifiers that actually replicated the sound qualities of the old vacuum tube models. But his favorite hobby has always been the study of advanced energy conservation methods using unconventional electromagnetic principles that most engineers have never heard of. Many experts claim this is impossible, but actually there are many systems that produce more work than we’re required to supply, because the excess energy is provided by the environment. A good example of this is the refrigerator. This ordinary kitchen appliance typically operates with a “coefficient of performance” of 2.0, which means that twice as much heat is removed from inside than the equivalent electricity used to do it. Most scientist believe that this kind of performance is only possible with heat systems, but John Bedini and others have demonstrated these principles with electromagnetics as well. In 1977, Ilya Prigogine received a Nobel Prize for what is basically an extension to conventional thermodynamics, which only describe how heat operates in “closed systems.” Those are systems that are cut off from any external form of energy. Prigogine’s work helped to extend our understanding of thermodynamics to include systems that are open to the environment, which slows the appearance of entropy down and allows more total work to be done than what we have to supply. That is exactly what the Bedini SG demonstrates in a simple and most elegant way. Several years ago, A & P Electronic Media, a digital publishing company founded by Aaron Murakami and Peter Lindemann published the first ever authoritative book on Bedini’s technology. Murakami and Lindemann have collectively known John Bedini for over 45 years and both have been personally mentored by him. Their first book outlining the basics of this technology is Bedini SG – The Complete Beginner’s Handbook, which includes all of Bedini’s own personal specifications for building his machines, as well as an in depth explanation of the science and theory behind its operation. With this book, just about anyone can build a working model. The second book is Bedini SG – The Complete Intermediate Handbook. It digs deeper into the theory of the technology and shows how John’s circuits act like miniaturizations of systems developed by Nikola Tesla over 120 years ago. What this process does is take the high voltage spikes from an electromagnetic oscillator and charge a capacitor with them. 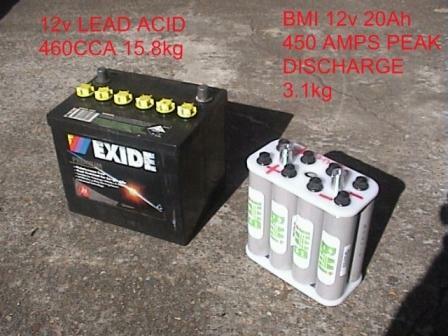 This capacitor is then discharged into a load, such as a lead acid battery. Engineers are normally taught to ground these spikes out so they don’t damage other electronics on an electrical line. In fact, that is what a “surge protector” is designed to do. Through experimentation, John discovered that these electrical transients have a number of unusual characteristics. One of these benefits includes the ability to charge batteries extremely efficiently, and even revive some batteries that are considered dead. Although many engineers claim these spikes can’t charge a battery because they are just high voltage with virtually no current, there are thousands upon thousands of global experiments being conducted with these circuits that prove otherwise. And if these spikes are used to charge a capacitor and then that capacitor is discharged into a battery, even more amazing results can be had. And this is one of the methods for using electricity that Nikola Tesla developed back in 1893. John’s circuits are literally a miniaturized version of some of Tesla’s greatest discoveries. 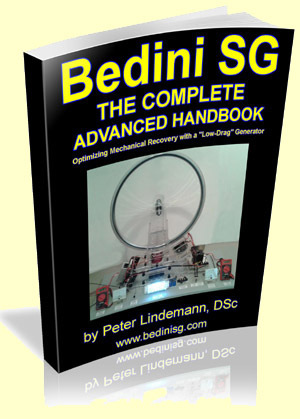 A & P Electronic Media has now released Bedini SG – The Complete Advanced Handbook. The finale to this paradigm-shattering trilogy teaches the reader how to convert the mechanical work produced on the wheel into even more electricity, in an extremely efficient way. As a matter of fact, it is so efficient that at the recent 2014 Energy Science & Technology Conference, Peter Lindemann was able to demonstrate how to light a large bank of LEDs to a very bright level without reflecting almost any mechanical load back to the machine. This third book also reveals many details from John Bedini’s other related technologies, some of which have never been released or explained to the public before. In that sense, it also doubles as a tribute to his tireless contribution to the field of advanced energy research over the last four decades. The Bedini SG has been around for about 15 years and it seems there is no end to the surprises that occasionally pop up that teach us one thing – we haven’t learned everything about it yet! On November 2nd, we’re launching Bedini SG – The Complete Advanced Handbook, which shows how to make low drag generators to make the most use of the mechanical work, but there is a whole lot more. One thing we’re going to full disclose is a special mode that John Bedini developed that allows us to increase the output by 100% with only a 50% increase of the input! How do we only increase the input energy by 50% but DOUBLE the amount that is available on the output? The Advanced book will give the entire schematic and working theory about how and why it works. On November 2nd, we’re making a video available on the Bedini SG website where we discuss all three books but we even show a demo where the electrical output doubles by only increasing the front input by half. If you don’t have the first or second book, just wait until November 2nd when you can get your hands on the entire triple combo pack at a huge discount! With this third book, this trilogy will give more information about real free energy circuits than anything that has ever been published. Especially when we disclose all the circuits necessary to accomplish it. 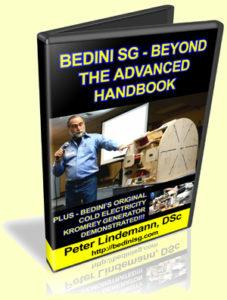 Bedini SG – The Complete Advanced Handbook is the most highly anticipated release that we have ever made available. Two of the most popular books are Bedini SG – The Complete Beginner’s Handbook and Bedini SG – The Complete Intermediate Handbook. The Beginner’s book walks the reader through all of the exact specification that John Bedini uses to build his own energizers, plus is shows the difference between repulsion and attraction mode which has only been discussed in the last couple years. The Intermediate book teaches all about Tesla’s Method of Conversion, which is taking the electrical recovery from the coil, charging a capacitor with it and discharging that to a low impedance load like a battery. The Advanced book will cover in great detail how to turn the mechanical work of the wheel into electricity in a very low draw way but it will also reveal a few more surprises. For the first time ever, details on the famous “Watson Machine” will be disclosed that have never been public as well as details on a few other Bedini technologies. This book has the keys necessary to take everything to the next level like never before. 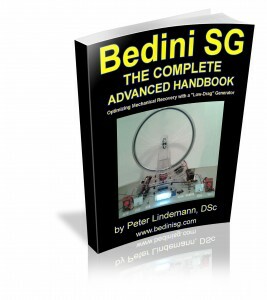 The release date for Bedini SG – The Complete Advanced Handbook is November 2nd, 2014. Thirty years ago at the Tesla Symposium in Colorado Springs, Jim Watson demonstrated a very large scale machine based on John Bedini’s 1984 Free Energy Generator. At the conference, the machine was running and producing a lot of mechanical work, but what was amazing is that it kept itself charged up the whole time! It had a large three foot diameter flywheel that weighed about 800 pounds attached to an aircraft starter motor, which was battery-powered. The generator section charged a bunch of coils like a magneto, which sent this back to the battery running the machine. 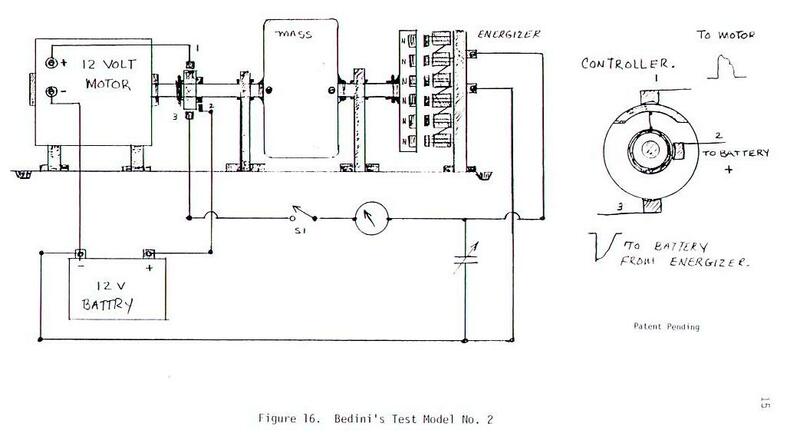 Below is a diagram that John Bedini showed for his smaller prototype. Between this image and some other diagrams – Jim Watson who had no electrical engineering background make it work. Over the years, many people have tried and failed at replicating these claims. Very soon, we are releasing Bedini SG – The Complete Advanced Handbook. Included in this highly anticipated release are details about the Watson Machine that nobody has figured out in the last 30 years. And, the keys to making it work have been sitting right there in plain site! There are already two books: Bedini SG – The Complete Beginner’s Handbook and Bedini SG – The Complete Intermediate Handbook. These are an absolute requirement to have in order to understand the basic working principles of self-regenerative energizers. And with the Advanced book coming, it will take everyone’s experiments and results to the next level! Good news! One of the most common questions we’re asked is, “Which charger do I need for my battery?” We just filmed two videos that explains this for both the Solar Chargers and Plug In Chargers. 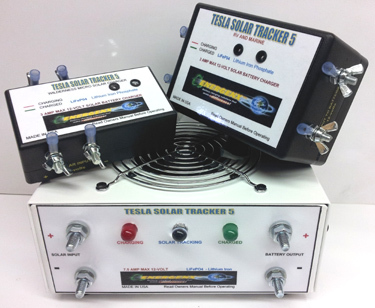 And here’s an update on the current inventory – send Jeff an email at info at teslachargers dot com to check availability. These can ship by this weekend!